Use our search box above to find bearings for your motorcycle or scooter. Wemoto stock all the motorcycle bearings you need - headrace, wheel, swingarm and linkage bearing kits, as well as supplying loose bearings, sleeves, seals and other parts. 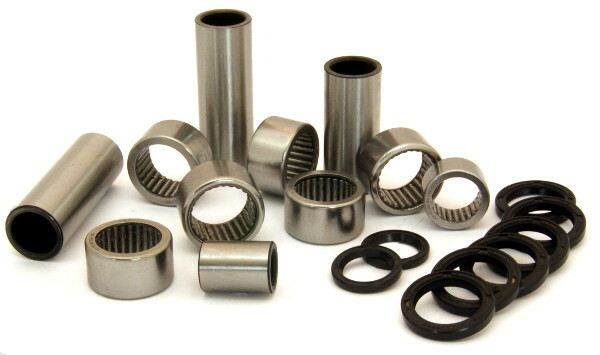 The different types available include deep groove roller bearings, needle bearings, tapered bearings, and cup and cone bearings. Wheel bearings are usually deep groove ball-type roller bearings, often sealed to both keep lubrication in, and water, mud and grit out. If one wheel bearing fails, the others usually follow, so it's best to replace all the bearings in one wheel at once. As well as stocking these parts individually, Wemoto have both Slinky Glide and All Balls wheel bearing kits, which contain all the necessary bearings and seals for one wheel. Rear wheel bearing kits also include sprocket carrier bearing where applicable. Wemoto stock both All Balls and Japanese headrace bearing kits, as well as the individual bearings. The most popular type of headrace bearing at Wemoto, they provide an upgrade for both motorcycle and scooter bearings. Their structure helps to spread the weight across the entire length of the roller so it withstands higher lateral forces, provides improve handling and is longer-lasting. 'Cup and cone' type bearings are also available for some older models and some scooters. For installation information, Wemoto stock instructional DVD guides, such as How to Replace Headstock Bearings. Slinky Glide linkage bearing kits include sleeves and seals when available. Individual needle bearings can also be browsed by size. For swingarm pivot bearings, a choice of tapered, needle, deep groove roller bearings, or even Teflon sleeve bearings is available.